Polarization is a compelling illusion. There are never just two sides unless people’s consciousness and choice are being manipulated. So show polarized people thinking and working together. Or instead of polarized people, choose people at random and reveal how unique and complex their thinking becomes, once informed into the big picture. I actually have an article on my website describing my big revelation on this – A Personally Transformative Encounter of Left and Right. I was raised in a progressive left socialist kind of family. The article describes how I was invited to a session that was more or less equally divided between people from the Left and Right as well as some people who were process people. I was kind of a process person, and kind of a leftie. The organizers had brought in some pretty good left-wing people. There were also some really top right-wing people there. The main organizer was a former right-wing militarist politician who had become a process person. The people that main organizer invited were major figures in the American conservative movement who I researched before I went there. I was thinking, “Oh my God, what am I getting involved in?” I got this horrible sense of who these people were when I read about them. Then I met them…. It wasn’t just that they were real people. I experienced a remarkable difference between their presence in the public sphere and my experience of them at this meeting person-to-person. And even when we talked politics, we discovered all sorts of common ground. And on some issues we agreed, “Why is this even a political issue? This is so obvious!“ It was revelatory. And I suddenly felt that my progressive stance – the coherence I carried about the progressive worldview and policy options and all the rest – was actually a trap: it was preventing me from being able to see these other people as people who I could potentially work with. So the sense of being divided and conquered became very vivid to me. I still have progressive responses in my bones, but since that gathering I have tried very hard to set them aside in all situations where it’s relevant, and I try to see the other people as people and as potential allies in finding common ground and seeking where we want to go together. That personal experience had a great shaping influence on my own thinking about this. And then I read about The Public Conversation Project’s work. One of the several things they did in their work was bring together people who were activists against abortion and people who were activists defending women’s rights to abortion (which is what most people in the US call “pro-life” and “pro-choice”). The realization generated by the process they used was that in the adversarial majoritarian systems we have set up, issues usually get boiled down to two sides, and you have to be pro or con, this or that, or you have to be supportive of this candidate and against that candidate. That framing means that you need to make alliances with people who you wouldn’t necessarily join up with and you have to speak out messages that you don’t totally agree with. Because in order to be effective, in order to win, in order to get anything done, you have to build the movements to get a 51% majority. That systemic dynamic makes it seem like people ARE on two different and irreconcilable sides, when in fact – as the Public Conversation Project found out – many people who are pro-life (that is anti-abortion) thought there were times when abortion was necessary, and some of people who were pro-choice thought that sometimes it didn’t make sense, that it was not right for women to have abortions or to push abortions in those circumstances. And they all could agree that every child should be a wanted child. There was lots of common ground that could be worked on. And after these meetings, these activists started to do their activism in more nuanced ways, to even disown some of their most extreme people in order to relate to each other and keep the issues being discussed in sensible ways in the public. That’s why I say these polarized positions are a compelling illusion. Once you get into a political argument, you can feel your nuances begin to disappear and you feel the need to push harder because otherwise you’ll lose. Just as in families and in friendships, the dynamics of polarization make you more invested in pushing your own idea which then supports the dynamics of polarization, round and round. 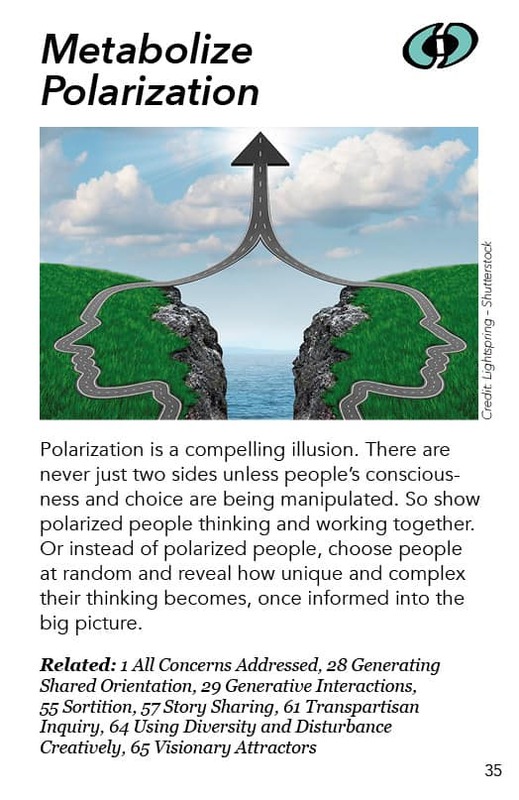 And of course political leaders and other kinds of leaders will use polarization to divide and conquer, pulling people over to their side to support them. That goes on all the time in the political realm, making extreme statements, using extreme imagery, and not giving space for the nuances, for unique viewpoints and for the complexity. Virtually every issue is very complex, but the adversarial politics make it seem black-and-white. My suggestion in this particular pattern is to show that seemingly polarized people can work together. The Maclean’s magazine that I talk about shows a dozen Canadians who were very different from each other. They actually talked together for two and half days and came up with plans about how to make Canada a better place. So if you can make that really vividly present, that would publicly demonstrate these dynamics. I know two people who created a book about this – You’re Not as Crazy as I Thought (But You’re Still Wrong). They are a strong social conservative and strong progressive who talked for a couple years trying to understand where each other were really at. They ended up making a book out of their conversations just to show how people who are very different can actually talk in sensible ways. Sometimes things shifted, sometimes they didn’t, but both gained more understanding and respect for each other, as they saw what went into each other’s feelings and perspectives. My own favorite approach is using random selection to move beyond the whole framing of polarization. Instead of getting a Left person and a Right person talking, let’s just see people as people and help them identify as citizens who are trying to figure out their country’s or their community’s needs, and how to satisfy those needs. That changes the way they think about themselves, too. They are framed at the beginning as part of a team rather than as people who are on two different teams. And then we can use conversational processes that bring out how unique and complex their thinking is, and what the gifts and limitations of each person’s perspective is and how it fits into the big picture that they’re trying to understand and put together, and the new picture they’re trying to paint together about their options and possibilities. Polarity management is another approach which I find fascinating, Proponents say that most polarities aren’t problems that can be solved. They are dilemmas involving interdependent factors that need to be kept in balance. One example I heard that particularly struck me involved the polarity “equality and freedom”. The more freedom you bring into a system the more people’s differences begin to magnify in the social system, in economic and political activities. These differences start to create inequalities, and then the inequalities get to the point where enough people go, “Wait a minute! This is not good to have the rich getting richer and the poor getting poorer! Certain people are more powerful in the system. The men are getting more powerful than the women!” (for example). So there’s a backlash to that injustice, creating a pull towards more equality. And as you legislate equality, and make inequality bad, you start to clamp down on people’s freedom. It is not a problem you can solve. You can’t ever get the extreme one way or the other. There’s always resistance once it starts getting too far. So this is defined not as a problem but as a dilemma. A dilemma is something you can’t solve. Rather, there is an intrinsic dynamic tension between them. 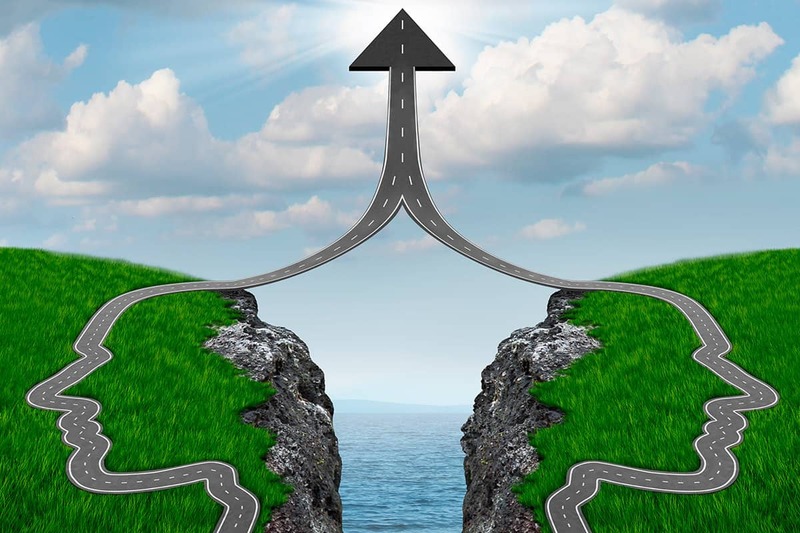 So polarity management is a way of recognizing those dynamics and being able to maintain more of a balance that keeps you from going into these dysfunctional extremes. A good example of “metabolizing” polarization – a digestion process – is the fishbowl process. Let’s say you have arguments between two sides, for example, the women don’t like the way they are being treated in the meeting. So you have the women sit together in the middle of the group and talk together while the men sit around the outside and listen. Then after 15 minutes or whatever, the men go into the circle and talk together while the women listen. This goes back and forth several times. Each side starts to address what they heard the other side saying, creating a positive feedback dynamic. This could, of course, make things worse. But well facilitated, it increases mutual understanding as people absorb the legitimacy and meaning of what each other is saying, and shift. I call this “metabolizing” because the different kind of “chemistry” created between the antagonized people generates new healthy understandings and relationships that feed rather than sicken the “body politic”. Ideas get taken apart and reconfigured into something more nutritious, just like food substances are taken apart and reconfigured during digestion into chemicals the body can use.